Viquesney was active in Spencer's social activities. Below is a description and photo of the "fraternal organization" that he created as a sort of send-up to the Elks and Moose Lodges. He called it the Beaver Club; the photo was taken at its 1931 Christmas party. Viquesney is shown in the center of the third row, and his first wife, Cora, is second from the right in the second row. Howard Briceland, who presented Spencer's Doughboy at its dedication in 1927, is seated at the front right. The club was formed by Viquesney in 1923 (not 1925, as stated in the graphic below), with the first meeting taking place in January of that year. Viquesney is sixth man from left, third row. First wife Cora is second from right, second row. 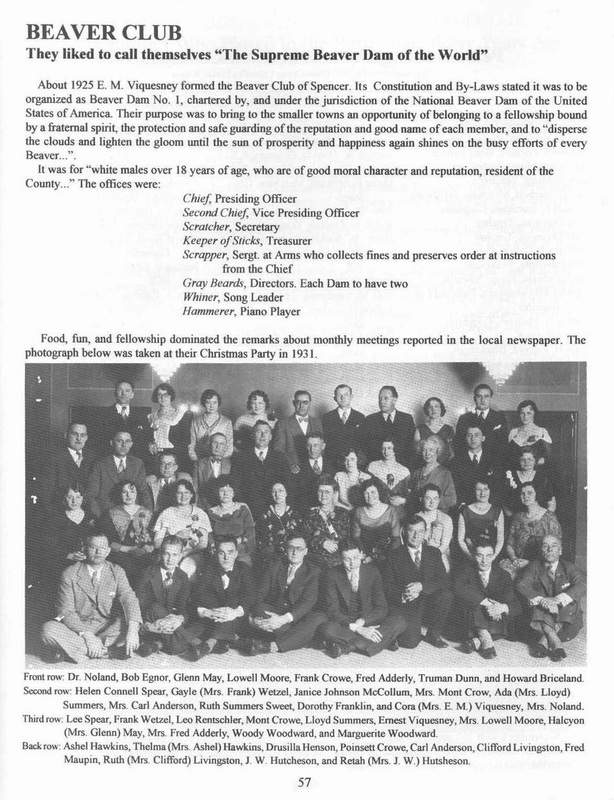 Page supplied by Owen County Historical Society Quarterly Newsletter.